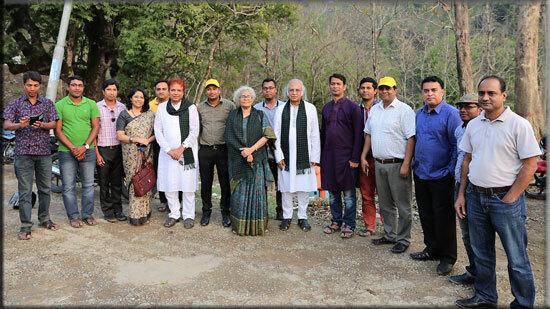 Dr Qazi Kholiquzzaman Ahmad, Chairman of Palli Karma-Sahayak Foundation (PKSF), has expressed satisfaction at the development activities carried out by the PKSF and its Partner Organisations (POs) in Chittagong Hill Tracts. “It was so heart-warming to see how the people in the hills, who used to be by and large left out of development activities, are now coming out of extreme poverty, and how the PKSF is standing by them in this journey,” said the renowned economist after concluding his 6-day visit to the hill districts — Chittagong, Bandarban, Khagrachhari and Rangamati. Dr QK Ahmad — who took over as the PKSF Chairman in 2009 and has since been leading the apex development institution established by the Government of Bangladesh towards making more human-centric interventions aimed at eradicating poverty and ensuring human dignity for all — was accompanied by Deputy Managing Director (Admin) Dr Md Jashim Uddin and General Manager (Programme) Mr Mashiar Rahman during the 16-21 March 2017 visit. He attended a range of programmes and inspected a number of PKSF-supported activities implemented by Integrated Development Foundation (IDF), Centre for Integrated Development Programme (CIDP) and Young Power in Social Action (YPSA) — all POs of the PKSF. On the first day, the PKSF chairman first went to Satkania Union of Chittagong where he inaugurated an ENRICH centre. The ENRICH, a brainchild of Dr QK Ahmad, is a flagship programme of the PKSF that works for sustained poverty eradication and beyond-poverty development for the extreme-poor households in rural Bangladesh. The programme adopts a ‘One Union-One PO’ approach to effectively deliver a range of activities to ensure ‘total development’ of the downtrodden. Each ENRICH union, like Satkania, has ENRICH Ward centres that serve as a hub of socio-economic, cultural and educational activities of the local communities. From there, the PKSF Chairman and his entourage inspected a Red Chittagong Cattle (RCC) farm in the same union. The farm, established by the IDF under the financial support from another highly successful PKSF programme titled ‘Livelihood and Innovation Fund to Test New Ideas (LIFT)’, promotes rearing high-yielding RCC. Dr Ahmad also exchanged views with a group of locals who had gathered at the farm to take training on RCC rearing. The day passed amid tightly scheduled programmes that included inauguration of a few more ENRICH centres and discussions with the leaders and representatives of different ethnic groups living in the hill tracts of Bandarban. The day ended with a colourful cultural programme in Sualok Union of Bandarban where members of local Mro community showcased their rich cultural heritage through musical performances. The next day, the PKSF Chairman inspected IDF-implemented ENRICH activities in Rangamati’s Wagga Union under Kaptai Upazila. He also inaugurated an ENRICH Social Centre for the Senior Citizens, inspected a health camp for the underprivileged ethnic groups there, and took part in a number of discussion programmes. 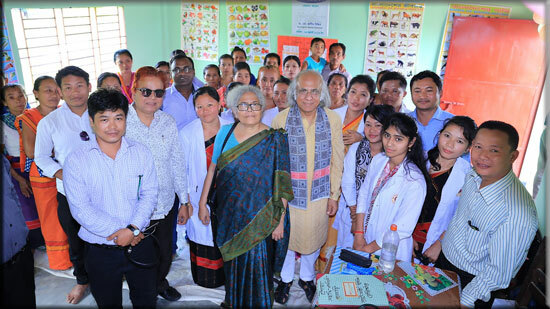 Defying intermittent rains and treacherous roads, Dr QK Ahmad — who is reverently termed as ‘Mr Forever 25’ by the PKSF employees for his tenacity and vivacity — then went to Sapchhari Union in Rangamati where the CIPD is implementing the ENRICH activities. The locals welcomed him and his entourage with a warm reception in their indigenous way. After inauguration of a couple of ENRICH Centres and discussions with the locals, it was time for him to inspect the PKSF-supported activities implemented by the YPSA in Panchhari union of Khagrachhari. On the last day of the visit, the PKSF Chairman inaugurated a convention of people with disabilities (PWDs) in Sitakunda of Chittagong. The YPSA in association with some local organisations of the PWDs organised the programme on the premises of its Human Resources Development Centre, established with financial support from the LIFT programme of the PKSF. The researchers there walked the PKSF top boss through their innovations that facilitate access of the PWDs to different resources. Dr QK Ahmad addressed a rally of around 2,000 PWDs and handed over grant cheques to some of them. “The PKSF will continue to work for rehabilitating the PWDs and including them in the mainstream workforce so that they can contribute more to the national development,” he said at the convention. As the hectic yet exhilarating six-day tour came to a close, the PKSF Chairman was all smiles. “Never stop believing in these people. With a little support, they can do miracles,” he said to a delighted Dr Jashim Uddin, who leads the implementation of both the LIFT and the ENRICH programmes from the forefront.